© Yvan Dube – Fotolia.com All rights reserved. Growing up with siblings gives you a unique perspective. If you are lucky, you are part of an inseparable unit, bound in ways that elude words. For children, there is a certain comfort that comes from living in a family, with allies of your own age group. It’s not always a fairytale, but in my life, having a brother and a sister has greatly enriched my life, and helped to give me a certain inner strength. As we get older, we realize just how powerful sibling ties are. Sadly though, today we live in a different time, and our children are no longer simply brothers and sisters. 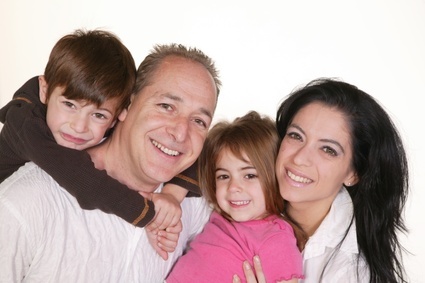 Visitation schedules and custody arrangements complicate a once uncomplicated reality. My own son is a half sibling; straddling the fence between feeling like an only child most of the time, and being a brother, in his heart, all of the time. While I was pregnant with him, I never considered that the living arrangements of my stepdaughter might be a huge source of distress for him.I worried about her, the non-custodial child, but to my surprise, she adjusted quite easily. My son, on the other hand, found her comings and goings inconceivable. His adjustment process was quite painful for all of us. I suppose it is hard to attach to someone who keeps being withdrawn from you. Children instinctively feel the loss of an interrupted attachment process. He also explained that although the child’s feelings are real and important, the parents own “issues” are stirred up, making it seem, perhaps, worse than it actually feels for the child. I found great solace in his kind words and have drawn on them to this day. My son, now four, has finally adjusted to our situation and can finally enjoy the time that he gets to have Mommy and Daddy all to himself. Watching your child suffer can bring on tremendous feelings of guilt. Trying to be fair to all children in a stepfamily and consider each one’s role and needs can make any parent’s head spin. Children residing with you can feel that their world gets turned upside down when their sibling comes to visit. Although they anxiously await the arrival of a stepchild, they can be hurt if they are rebuffed by siblings who are dealing with their own tornado of comings and goings. The conflicts that nuclear siblings have the luxury to work through often get left unresolved with a stepchild, leaving children vulnerable to unattended feelings. That is why open communication with both your bio children and stepchildren is essential. Don’t be afraid to speak the truth and encourage them to do so also. There is an array of ambivalence for children on all sides of this situation. They need to be encouraged to work through their feelings without judgement or guilt being placed upon them. Jealousies and anger are all normal. Try to accept all of the children’s feelings as well as your own. When it comes to kids in blended families, there are no magical guidelines that can guarantee that everyone will be content with their place in the family. We can not predict how new children will react to the rhythm of their lives or how stepkids will adjust to the many changes they will face.. We all just need to expect, as well as accept, the many unexpected feelings that will arise. To just be there for each of them, is sometimes the best we can do… and we need to remember, that’s plenty. Copyright © 1997 K.C. Blake, reprinted by permission. This article first appeared in Life’s Landmine’s to Landscape’s.